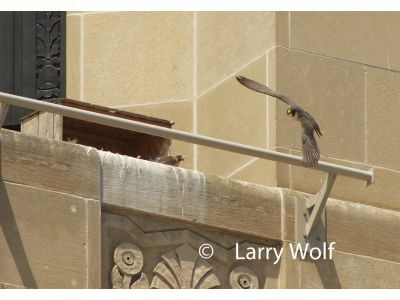 The Peregrine falcon chicks that nest in the 5/3 building downtown escaped being banded due to fear of injury. Nik Kalejs, head of Peregrine falcon banding for the Michigan DNR, made the call. After seeing the size and mobility of the chicks, he determined that risk of injury to the chicks and the potential to scare the birds off the edge was too great.